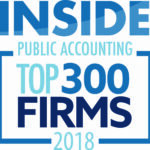 Goldin Peiser & Peiser (GPP) is pleased to announce that it has been named as a top 300 public accounting firm in the nation by the leading accounting trade publication, Inside Public Accounting. This is the first year GPP has made the list and is one of only 6 firms on the list whose headquarters are in North Texas. GPP is a full-service accounting and consulting firm located in Dallas, Texas. The firm provides a broad range of services including accounting, audit, tax, outsourced CFO, mergers & acquisitions, and IRS assistance and defense. GPP specializes in today's most dynamic industries: dental, healthcare, manufacturing, and distribution and serves them with an exceptional range of credentials and skills. Through its membership in BDO Alliance USA, GPP can offer clients the resources and reach of the 5th largest accounting and consulting network in the world, while providing personalized service to its clients.